Buy 'em cheap; buy 'em strong; trend is your friend. Discussing permutations on the same three themes can get boring, but one thing is clear from years of reading/writing/discussing research: value, momentum, and trend are arguably the undisputed factor kings. Few phenomena have the empirical breadth and depth to match these subjects. But what is the Global Value Momentum Trend Index? Put simply, we are wrapping our three favorite strategies into one Index — the GVMT Index. We have developed our own algorithms to capture these three exposures and we explain in this post how each component works. Before we start, a few caveats are in order. First, we want to be clear that our Index is not the holy grail of investing. (1) Second, the Index is designed for a segment of investors that are 1) long-term oriented and 2) are willing to invest the time to understand our process. (2) In summary, the GVMT is definitely not for everyone. With that said, there are various ways in which an investor can use a unique exposure such as GVMT. Core Satellite: Bolt GVMT on a core low-cost beta portfolio. Factor Diversification: Deploy a targeted allocation alongside large-cap global factor exposures. Alternative Exposure: Add the exposure in the alternative bucket, as a diversifier and a possible replacement for long/short equity. Core Equity: Own as a core global equity exposure with a built-in risk management system. In the end, GVMT can be deployed in a variety of ways, all with different costs and benefits. But at the core, the Global Value Momentum Trend Index (GVMT) simply represents a transparent and systematic approach to combining value, momentum, and trend exposures into one unified process. We hope this piece helps investors better understand our Global Value Momentum Trend Index. We seek to deliver global value and momentum equity exposure, while simultaneously minimizing the chance of extreme losses. *Information on the QV, IQV, QM, and IQM Indexes are available at alphaarchitect.com/performance or upon request. Value Strategy: The strategy consists of a combination of our U.S. and International Quantitative Value Indexes (QV Index and IQV Index). Momentum Strategy: The strategy consists of a combination of our U.S. and International Quantitative Momentum Indexes (QM Index and IQM Index). Trend Strategy: The strategy consists of a combination of two long-term trend-following rules (Time Series and Moving Average). We will walk through each of these components and/or reference the appropriate materials to learn more about each aspect of the process. The GVMT process can be broken into three distinct aspects, which we explore in-depth so readers have a clear understanding of the approach. In this section, we will discuss the first two components of the GVMT Index strategy: the value strategy and the momentum strategy. The goal of these 2 components is to construct a global equity portfolio with high expected returns (over the long-haul). We think our value and momentum strategies are differentiated from the rest of the pack for the following key reasons: Focused exposure, heavy R&D efforts, and our unique approach. Why do we care about focus? As a starting point, we examine the historical performance of generic value and momentum strategies using “academic” portfolio constructs, which typically sort stocks into deciles based on some characteristic, and then calculate the performance of this strategy over time. Systematic value strategies simply buy cheap stocks based on a price-to-fundamental ratio (e.g., P/E). Systematic momentum strategies buy stocks that have performed the best relative to other stocks (e.g., relative strength measured over 12 months). In general, these academic “decile” portfolios, which buy the top 10% of the universe based on some characteristic, are much more “focused” than the typical “closet-indexing” portfolio with hundreds of stocks. Performance figures contained herein are hypothetical, unaudited and prepared by Alpha Architect, LLC; hypothetical results are intended for illustrative purposes only. Past performance is not indicative of future results, which may vary. Index returns are for illustrative purposes only and do not represent actual fund performance. Index performance returns do not reflect any management fees, transaction costs, or expenses, which would reduce returns. Indexes are unmanaged and one cannot invest directly in an index. Source: Ken French Data and Bloomberg. Systematic “academic” value has done well over time, but as we’ve discussed in the past, the short-term relative performance pain is often extremely difficult to digest and requires a sustainable mindset. Just like value, momentum “works,” but these processes require that an investor endure horrific bouts of relative underperformance that perhaps only an alien could withstand. If focus is so great, why aren’t there more focused factor portfolios? If investors believe the evidence presented in academic research, why are they buying factor portfolios with no resemblance to the portfolios that generated the evidence in the first place? Turns out that the real world is a lot more complex and managing “academic” style portfolios may not be an optimal solution for a lot of investors and for a lot of reasons (e.g., tracking error, transaction costs, taxes, constraints). In fact, based on how many “factor-based” strategies are constructed, it is clear that there isn’t a huge demand for “academic” style portfolio constructs. For example, consider the Vanguard Value ETF (ticker: VTV), one of the largest “value factor” ETFs, which tracks the CRSP US Large Cap Value Index. The figure below highlights how closely the performance lines up with SPY, an ETF that tracks the S&P 500 Index. The performance data shown represent past performance, which is not a guarantee of future results. Why is this the case? The VTV ETF tracks an index that is not designed like academic portfolios because there is a consideration for tracking error. In other words, the CRSP Index that VTV follows is constrained to not drift too far from the S&P 500 Index. Given the mission of VTV, this probably makes sense. A lot of investors are using this as essentially an S&P 500 plug, with a small tilt towards the so-called value factor. So what’s the point? The point is not that closet-indexing or tracking-error constrained portfolios are bad. 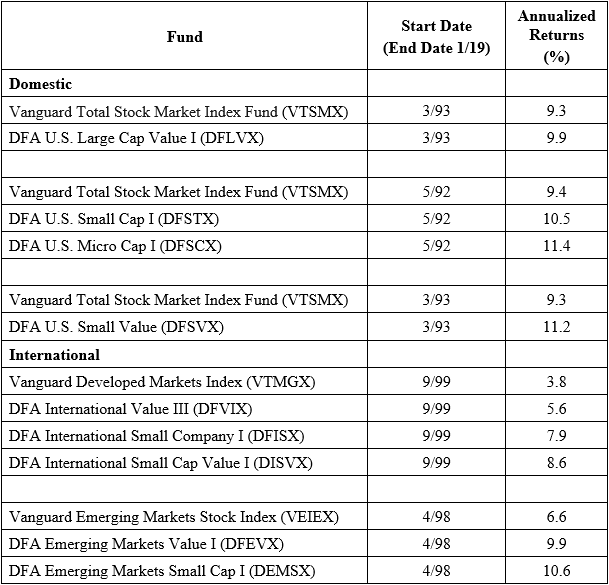 These portfolio constructs serve a purpose and can be a great solution for many investors. However, if the goal of a portfolio is to capture the premiums associated with focused academic portfolios, the portfolio construction should look a lot like the academic portfolios. And almost by definition, this means the portfolio will be more concentrated, have higher tracking error, and take on various risks. Simply put, there are trade-offs between the approaches and for additional study on this subject, you can check out a few of our posts here, here, and here. Why do we care about research? We’ve spent many years identifying ways in which we could improve the basic academic value and momentum strategies. In fact, we got so deep into the weeds we decided to write books on the subject. If you are an uber-geek, we encourage you to check them out at your convenience (Quantitative Value and Quantitative Momentum). We are also happy to mail you copies if you shoot us a note and genuinely love this stuff. But if the books are a bridge too far, you can also get a good description of the processes for our Quantitative Value approach here, and our Quantitative Momentum approach here. Identify Investable Universe: We typically generate 900 names in this step of the process. Forensic Accounting Screens: We usually eliminate 100 names, bringing the total to 800 stocks. Valuation Screens: Here we screen the cheapest 10% of the universe, or 80 stocks. Quality Screens: We calculate a composite quality score and eliminate the bottom half, leaving 40 stocks. Invest with Conviction: We invest in our basket of 40 stocks that are the cheapest, highest quality value stocks. And how about our momentum approach? Identify Universe: We typically generate ~ 1,000 names in this step of the process. Core Momentum Screen: Select the top decile of firms on their past momentum, or 100 stocks. Momentum Quality Screen: Select high-momentum firms with the smoothest momentum, 50 stocks or 50%. Seasonality Screen: Rebalance the portfolio near the beginning of quarter-end months. Invest with Conviction: We invest in our basket of 50 stocks with the highest quality momentum. The goal of both approaches is to capture the value and momentum premiums, but incorporate smaller-sized stocks and strategy-specific quality metrics into the equation (which seems reasonable based on recent factor replication research). Why do we care about diversification? As outlined above, we have our own version of value and momentum. But as part of the GVMT process, we choose to combine our value and momentum strategies into a single global portfolio. Why do we take this approach? There are reams of academic research on this subject, but to summarize, combining value and momentum strategies has the potential for large diversification benefits (here is a good post if you would like to dig deeper). We now move on to discuss component 3 of the GVMT strategy, which incorporates trend-following into the process. The third component of the GVMT process is a trend strategy. And the goal of this component is to minimize the impact of extreme equity market drawdowns that will inevitably be associated with components 1 & 2 of the GVMT strategy — a focused global value and momentum equity portfolio. Charts presented are for illustrative purposes only. Our Trend-Following Models may not work in all situations and could fail to achieve their objectives. The chart on the left highlights the problem with permanent loss of capital events. A 50% loss of capital needs 11 years of compounding at 7% to break even. Some investors won’t be around in 11 years, let alone have the ability to sit tight for a decade just to break even. Clearly, huge losses need to be avoided. But as we mentioned, there is no such thing as getting returns and avoiding all risk. But “risk,” if it is defined as volatility, may not be a huge issue. The chart on the right makes this a bit more clear. In this scenario, the investor eats a 15% loss. Definitely not fun, but not devastating. The portfolio only needs 3 years to dig out of its hole and get back to breakeven. Three years of sitting on your hands is painful — no doubt — but a lot better than 11 years. So what’s the lesson? Simple: losses are manageable but large losses are disastrous! We recognize that all investments that plan to earn an excess return have to be volatile — that’s investing — but perhaps we can explore methods to try and minimize catastrophic losses associated with these strategies? One way of achieving tail risk management is via diversification. Diversification is a no-brainer for all investors — we obviously need to be diversified. But as 2008 highlighted for many investors, diversification won’t necessarily eliminate tail risk. Another potential option is trend-following, which is a simple approach: own risk if it is in a positive trend, otherwise, avoid risk. Based on our collective take on external research and extensive internal research, we’ve come to the conclusion that trend-following seems to be the most promising way to minimize extreme tail-risks in a portfolio. To reiterate the point expressed above regarding equity risks, trend-following won’t eliminate risk — heck, in some scenarios it can increase volatility — but if tail risks are your concern, trend following is the best answer we could find. If you’ve made it this far — congrats — we’re almost there! But how do we combine these three components into an integrated system? The first step in the process is figuring out how to allocate across components 1 & 2 of the system — the value strategy and the momentum strategy. Each stock index contains 40-50 stocks, so when all four indexes are combined into a global value and momentum portfolio there are generally 180-200 stocks in the overall portfolio. The next question relates to how does the GVMT Index allocate across the four portfolios? We decided to go with a volatility-weighted approach because we want to equalize our risk exposure (as opposed to dollar exposure) across the 4 Indexes. (8) Our process for volatility weighting is often deemed “simple risk parity.”(9)The downside of volatility-weighting the positions is an added layer of complexity, but the GVMT approach is 1) simple and 2) annually rebalanced to minimize the noise/frictional costs of more complex allocation strategies. *Hypothetical outcome to illustrate the concept. Indexes are unmanaged, do not reflect management or trading fees, and one cannot invest directly in an index. Exposures are for illustrative purposes only and not to scale. In the hypothetical example above, the geographic breakdown is 52% international and 48% U.S. On the factor side of the house, there is a 45% allocation to the momentum strategies and a 55% allocation to the value strategies. These figures are hypothetical and meant to convey the message. But we can generate the historical geographic and factor allocations for the GVMT Index throughout the history of the Index. On average the geographic exposure is fairly evenly split. The next step in the process is to assess the trend-following rules that are generated by our trend strategy. To further describe how this may work in practice, let’s work through an example. To start, the trend rules are calculated for the U.S. market and the International market, separately. Domestic trend rules: Each month end, calculate the TMOM and MA rule on the S&P 500 Total Return Index. International trend rules: Each month end, calculate the TMOM and MA rule on the MSCI EAFE Total Return Index. We are sitting at the close on March 31, 2018. 12-month cumulative total return on treasury bills are 2%, S&P 500 Total Return Index is 5%, and MSCI EAFE Total Return Index is -1%. S&P 500 TR Index is above the 12-month moving average, MSCI EAFE Total Return Index is below the 12-month moving average. Domestic TMOM: The S&P 500 TR Index has earned 5% relative to the treasury bill return of 2%. No rule trigger. Domestic MA: The S&P 500 TR Index is above the 12-month moving average. No rule trigger. International TMOM: The MSCI EAFE TR Index has earned -1% relative to the treasury bill return of 2%. Rule triggered. International MA: The MSCI EAFE TR Index is below the 12-month moving average. Rule triggered. The example above is hypothetical, but we can also review the historical Robust Trend Rules over time for the GVMT Index. The Robust Trend Rules are fairly dynamic over time. Moreover, while the U.S. and the International rules are certainly correlated, they don’t line up exactly, which implies that the U.S. and International markets can have different trend profiles at any given point in time. The final step in the process is taking the calculations from step 2 and then translating them into a hedged exposure. We’ll discuss how that works and the details of how hedging works in the GVMT portfolio. Let’s work through a hypothetical example to illustrate the idea. Now, we need to calculate the hedge exposures for our U.S. equity beta exposure and our International equity beta exposure based on the trend rules outlined above. Operationally, this implies we will short an equity instrument that tracks the MSCI EAFE Index (e.g., EFA). The position will equal 52% of the total value of the portfolio. There will be no hedge position for the domestic equity exposure. On net, the portfolio will be 100% long the four underlying value and momentum exposures (i.e., US/Int’l Value and US/Int’l Momentum), and have a short position equal to 52% of the portfolio value. U.S. equity exposure will be 100% and international equity exposure will be in a “market neutral” status. In our example, the geographic breakdown is 52% international and 48% U.S. The portfolio is fully hedged on the international side and has no hedge on the domestic component of the portfolio. The net portfolio market beta (adding up the U.S. and international exposures) exposure is 48% (48% U.S. + 0% International). Performance figures contained herein are hypothetical, unaudited and prepared by Alpha Architect, LLC; hypothetical results are intended for illustrative purposes only. Past performance is not indicative of future results, which may vary. Index returns are for illustrative purposes only and do not represent actual fund performance. Index performance returns do not reflect any management fees, transaction costs, or expenses, which would reduce returns. Indexes are unmanaged and one cannot invest directly in an index. We’ve spent a lot of time developing three systematic processes: Quantitative Value, Quantitative Momentum, and Robust Trend. Each of these systems can be used individually to solve specialized problems. However, the Global Value Momentum Trend Index packages these three concepts into a single approach. For some investors, the combined approach of GVMT may be more appropriate than using the individual pieces. In the end, the Global Value Momentum Trend Index seeks to deliver focused exposure to our favorite investment ideas: value, momentum, and trend. Information on our Global Value Momentum Trend Index is available here. 1. ↑ There are many great ideas out there and we don’t stake a claim on having the perfect answer. 2. ↑ If you are reading this post, you are probably a good fit. ROBUST_TREND = 50% 12-month time series momentum rule and 50% 12-month simple moving average rule. Monthly assessed. If Excess return >0, go long risky assets. Otherwise, hedge the position by shorting the passive index (S&P 500 and/or EAFE). If Current Price – Moving Average (12) > 0, go long risky assets. Otherwise, hedge the position by shorting the passive index (S&P 500 and/or EAFE). 9. ↑ see risk parity for dummies for background or review the image below. 10. ↑ The dramatic changes in allocations are associated with annual rebalance periods. 12. ↑ In more detailed analysis we examine the beta of our GVMT Index against a variety of factor models (CAPM, FF 3-factor, Carhart 4-Factor, FF 5-factor, and AQR 6-factor) and confirm that the beta is typically around .5 to .6, depending on the factor model used. GVMT_INDEX_NET = Annual rebalance (First Week of May) across QV INDEX NET, QM INDEX NET, IQV INDEX NET, and IQM INDEX NET. Alpha Architect calculations through 12/31/2015; Solactive calculations thereafter. ROBUST Trend manages a dynamic 0-100% hedge component. Trend rules trigger index related trading for the hedge and components and are rebalanced monthly. Interest earned is assumed to be 90-day T-Bill minus 0.5%; Interest paid is assumed to be 90-day T-Bill plus 0.5%. Hedging can create exposures that drift from the model weights. We manage this risk by trading back to model weights when there is a trigger or there is no longer a hedge position. Downside Rebalance Trigger (% from Model): 10.00%. Upside Rebalance Trigger (% from Model): 10.00%. Net of 1% in costs. QV INDEX NET = Quarterly rebalanced, equal-weight, total returns including dividends. Alpha Architect calculations through 10/31/2014; Solactive calculations thereafter (Official index is QVAL Index). Net 2% in costs. QM INDEX NET = Quarterly rebalanced, equal-weight, total returns including dividends. Alpha Architect calculations through 12/31/2015; Solactive calculations thereafter (Official index is QMOM Index). Net 2% in costs. IQV INDEX NET = Semi-annually rebalanced, equal-weight, total returns including dividends. Alpha Architect calculations through 12/31/2014; Solactive calculations thereafter (Official index is IVAL Index). Net 2% in costs. IQM INDEX NET = Quarterly rebalanced, equal-weight, total returns including dividends. Alpha Architect calculations through 12/31/2015; Solactive calculations thereafter (Official index is IMOM Index). Net 3% in costs. 14. ↑ In this section we address common technical questions regarding the Index. We recommend you contact us if you are interested in more details. Why Do We Hedge As Opposed to Going to Cash? Let’s say a trend rule triggers and we now need a short position to hedge our long portfolio. For illustration purposes, let’s also assume we need to fully hedge the portfolio (“Full Hedge”). As we discussed above, the GVMT INDEX is always long a portfolio of Value and Momentum stocks. Let’s say the Index value is $100. If the Index wants to short $100 of a passive index to maintain a fully hedged stance (Note one can also use futures), typically done via an ETF vehicle such as the SPY or EFA, the Index can rely on the fully paid securities ($100) as collateral to open a short index ETF position. The Index could also sell all the Value and Momentum stocks to minimize market risk on the portfolio and invest the proceeds in cash or Treasury Bills. So why did we choose to have our Index always own the underlying Value and Momentum stocks and hedge via a passive instrument, as opposed to selling down the equity? Aside from the greatly enhanced frictional and tax costs of trading in and out of the holdings, there is a potential investing benefit of maintaining the underlying stock positions during a hedging event. Please see our detailed education materials for this analysis. To open a short position, a prime broker will assess the collateral and decide the margin requirement. Typically professional investors access what is referred to as portfolio margin (as opposed to Reg-T margin), which accounts for portfolio characteristics when assessing margin requirements. This is important in our context because the margin requirements to enter a short position, which is negatively correlated with our long positions, means that our margin requirements will often be much less than 50% (Reg-T requirement). Let’s say the prime broker determines that the margin requirement to hold the short position is 20%. In this case, the portfolio would need to borrow $20 ($100*20%) from the prime broker, and will pay an interest rate on this borrowed amount. The interest rate is typically, Borrow Rate = Fed Funds + markup, where the markup ranges across brokers. Once the prime broker determines there is the necessary collateral in place, the portfolio can initiate the short ETF position, and will receive $100 in cash from the short sell. The portfolio will pay a cost to borrow the position (often called the short rebate) to maintain the position (SPY is around 30-35bps/year), but the portfolio will also receive interest on the $100 in short proceeds. The interest rate received on the short position is typically the Fed Funds rate minus some haircut. Cost = (Margin Requirement %)*($100)*(Fed Fund Rate + Markup) + ($100)(Short Rebate Cost) – ($100)*(Fed Funds Rate – haircut). Annual Costs = 20%*$100*(1.5%) + $100*0.30% – $100*(0.50%) ~ 0.10% or 10bps. In other words, there is a 10bps negative carry for holding the short position. In general, with higher interest rates the carry becomes more positive and with lower interest rates, holding a short position will have a negative carry. Last, it should be pointed out that the portfolio, like any other portfolio that engages in short-selling or other derivative transactions, does take on some counterparty risk by employing such a strategy.